In July of 2011, BHP Billiton and Petrohawk announced a deal in which BHP acquired Petrohawk for over $12 billion. Read more on the deal at at our Eagle Ford Shale News section under the post BHP Petrohawk Deal Brings Australia to the Eagle Ford Shale. BHP's corporate takeover of Petrohawk includes a core position in the Eagle Ford Shale. Petrohawk announced the discovery of the Eagle Ford Shale in October of 2008. The company then went on to lease three core areas, the Black Hawk, Red Hawk, and Hawkville fields, that include acreage across several counties. Petrohawk was dedicating more rigs to the Black Hawk and Hawkville fields, but is continuing drilling and evaluation of its Red Hawk acreage. 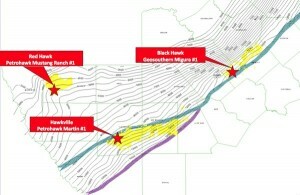 With BHP taking control of operations and having access to more capital than a company the size of Petrohawk, it is likely that the Red Hawk Field will have higher activity levels than it would have with Petrohawk the operator. Petrohawk was an early entrant in the Eagle Ford Shale and has now shifted much of its resources from the Haynesville Shale and other gas plays to the Eagle Ford. The company prefered to operate its properties, but does have a JV with Swift Energy on acreage in McMullen County, TX. BHP will likely increase levels of activity to hold leases and accelerate value creation in the Eagle Ford. The company will be operating for many years to come as it first drills to holds leases and then begins to down space and fully develop its leases. BHP Billton is a diversified natural resources company that engages in the exploration, development and production of oil & gas, bauxite, alumina, aluminum, other base metals, the mining of diamonds & titanium metals, and the development of Potash. The company headquarters is in Melbourne, Australia. The company made unconventional gas and oil headlines through the 2001 acquisition of Chesapeake Energy's Fayetteville assets for $4.75 billion and the the acquisition of Petrohawk Energy for over $15 billion including debt. The company will be one of the top 10 natural gas producing companies in the US once the two deals close. The onshore US busines now includes material positions in the Avalon Shale, Bossier Shale, Eagle Ford Shale, Fayetteville Shale, Haynesville Shale, and other emerging plays in West Texas. Petrohawk Energy Corporation was described as an exploration, development, and production company that has exposure to oil and gas. Petrohawk (NYSE: HK) became a leader in the shale plays after being an early entrant in the Fayetteville Shale (Arkansas), Haynesville Shale (Louisiana and Texas), and the Eagle Ford Shale (South Texas). The company divested its Fayetteville assets in 2010 to focus in other growth areas. Petrohawk also has a significant position in the Permian Basin of West Texas where it targets the Avalon Shale, Bone Springs, and Wolfcamp formations in the Midland and Delaware Basins. BHP plans to spend $3 billion of its $3.9 billion budget for onshore U.S. in the Eagle Ford in 2014. The company's operations remain focused on the liquids-rich portion of the Eagle Ford. BHP's average drilling times in the Eagle Ford are averaging 20 days, and some have been drilled as quickly as 12 days according to Skaufel. In addition to drilling efficiency, the company is also focused on improved completion optimization and well spacing in the Eagle Ford. "The development of the liquids-rich Eagle Ford Shale and our exploration program in the Permian Basin is our major priority at this stage as we look to increase the valuable liquids component of onshore U.S. production to 20% by 2015 on a BOE basis." In a quarterly filing, BHP warned its ability to bring natural gas to market could be limited by the recent growth in production, but not pipeline infrastructure, at the Eagle Ford shale region in Texas. "If we are unable to obtain adequate amounts of takeaway capacity to meet our growing production levels, we may have to delay initial production or shut in (some of) our wells," it said. BHP petroleum chief Michael Yeager has indicated BHP will be making infrastructure investments in the Eagle Ford region. BHP Billiton Petroleum Chief Executive, J. Michael Yeager, said the Petrohawk acquisition would add high quality growth to the company. provides the potential to more than double our existing resource base. Following completion of the Petrohawk transaction, BHP Billiton Petroleum will be on track to deliver a compound annual production growth rate of more than 10 per cent for the remainder of the decade as we accelerate our shale development program and leverage our strategic capability in the deep water.